The Bishop’s Mills WI is a group of ‘Women Involved’ in the community – working in business, in the community, on farms, at home, with children, young and young-at-heart, new residents and those of long-standing. BMWI meets the second Thursday of each month, usually in the community hall, except for July and August. Contact 613 258 3978 for more information. Like us on Facebook, check out the Bishop's Mills page for more information. All local women, visitors and new residents are welcome to attend our meetings. Meet your neighbours, share your stories and build community! In 1897, Adelaide Hoodless addressed a gathering of 101 women at a Town Hall meeting in Stoney Creek, Ontario. Since her youngest child had died from drinking impure milk, she had been striving to improve common nutritional and sanitary practices, and had worked with the YWCA towards this goal. What she proposed at the 1897 meeting was the formation of a new women’s group, inspired by the Farmers’ Institutes but not connected to them, that would focus on educating women in better homemaking practices and “more scientific care of children”. From this meeting came the founding of the first Women’s Institute Branch at Stoney Creek. Adelaide Hoodless and Erland Lee, who had helped to facilitate the 1897 meeting, are officially recognized as the founders of the Women’s Institute. Although growth was slow at first, by 1914 there were nearly 25,000 members in 843 branches. In 1919 the Federated Women’s Institutes of Ontario and the Federated Women’s Institutes of Canada were formed. The WI had soon expanded its interests to include topics such as law and finance, and became involved in community work and in promoting social reform. Over the years WI’s have contributed to both their local and wider communities in many ways. They have improved educational opportunities for women; raised money for and promoted community projects such as hospitals, libraries and schools; contributed to Canada’s war effort in both World Wars and lobbied various levels of government for everything from improvements in infrastructure to appointing women to the Senate. The keeping of the Tweedsmuir History books, which document a community’s local history, has also been a valuable role played by WIs, as has simply providing an enjoyable social venue for rural women. 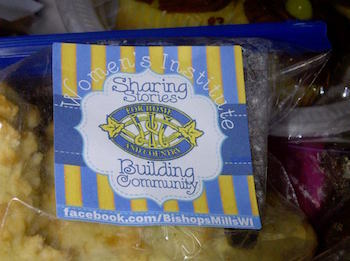 The first Women’s Institute in Bishop’s Mills was formed in 1914. Unfortunately, we do not have any records remaining from this period, but reports in the local newspaper from 1916 mention that the group had installed a library in the village and, later that year, that they had contributed “a shower of comforts for wounded soldiers”. This WI appears to have disbanded around 1930. In 1985, when the village marked its centennial, a new Bishop’s Mills Women’s Institute was begun, with 20 charter members. Since then the group has made many contributions to the community, such as supporting the Community Hall, holding a Christmas Auction each year, running a popular Scarecrow Contest for several years, and maintaining Tweedmuir History books. They have also lobbied for 911 service in Oxford-on Rideau Township, worked with several waste management initiatives, donated money towards the construction of a new play structure in the village park, helped in bringing a 4-way stop to the village and in setting up a Neighbourhood Watch Program.